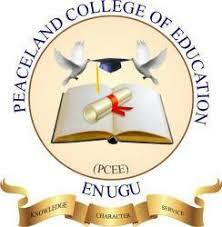 Peaceland College of Education Enugu, Nigeria In Affiliation with the Chukwuemeka Odumegwu Ojukwu University, COOU Formerly known as Anambra State University NCE & Degree Admission Form, Courses, Admission Requirements, Application Guidelines for 2018/2019 Academic Session. Applications are invited from suitably qualified candidates for admission into the Peaceland College of Education, Enugu NCE and Degree Programmes for 2018/2019 academic session. Minimum of 4 credits in Senior School certificate Examination- WAEC/NECO or Equivalent. The Joint Admissions and Matriculation Board (JAMB) Examination Score acceptable by the institution. Entry Requirements for Bachelor of Arts or Bachelor of Science in Education (B.A. Ed or B.Sc. Ed) Programmes. Minimum of 5 credits in Senior School certificate Examination- WAEC/NECO or Equivalent. The Joint Admissions and Matriculation Board (JAMB) Examination Score acceptable by the institution. In addition to Minimum of 5 credits in Senior School certificate Examination- WAEC/NECO or Equivalent, the candidate must have any of the following or its equivalent ; Nigeria Certificate in Education (NCE), Advanced Level GCE, Interim Joint Matriculation Board (IJMB) Examination, Ordinary National Diploma (OND), Higher National Diploma (HND) or Degree in similar field. Read Also: Peaceland College Postgraduate Admission Form 2018/2019. • Enter your JAMB Registration Number. • Proceed with the completion of the form. • Correctly enter your O-Level results. • Print your acknowledgement slip. Information provided on the application form will be used for Admission screening especially the Results.